Legendary college basketball coach John Wooden once said, “The true test of a man’s character is what he does when no one is watching.” But the truth is, the pervasiveness of social media means that in this day and age—everyone is watching. For brands, this presents both a challenge and an opportunity to showcase not just what their company stands for, but what it stands up for through cause-related initiatives. Where cause marketing once entailed fundraisers and galas, its evolution has led to more consumer-centric, event-based brand campaigns that don’t just advocate for causes, but actively support them through live experiences. It’s not hard to see why—as an increasing number of consumers, particularly millennials, make purchase decisions based on whether or not a company is legitimately contributing to the greater good, more brands are making an effort to improve their business by improving the world around them. And with 87 percent of Americans reporting they would purchase a product because a company supported an issue they cared about (according to a 2017 Cone Communications study), it seems that now, more than ever before, companies can’t get away with just talking the talk; they have to walk the walk. Following is a look at how six brands are leveraging cause marketing campaigns to drive change and lead by example. Corona’s brand is nearly synonymous with the beach, and given the roughly eight million metric tons of plastic waste being dumped into the ocean each year, it was only fitting for the brand to launch a campaign aimed at raising awareness of marine pollution. Ahead of World Oceans Day on June 8, the beer brand leveraged the experiential art trend by erecting “Wave of Waste” installations comprised entirely of used plastic collected from nearby beaches in London, Melbourne, Santiago, Bogota, Santo Domingo and Lima. The sculptures were designed not only to raise awareness, which was achieved with the help of actor Chris Hemsworth, but also to help consumers visualize the scale of the problem. Accordingly, Corona gave passersby a chance to add to each sculpture by dropping off their own plastic waste at the site of the billboard. The campaign also included a partnership with Parley for the Oceans. Together, the organizations created limited-edition Hawaiian shirts made from plastic collected from open ocean, remote islands and coastal communities. Designs featured common plastic items, like bottles and toothbrushes, incorporated into a seascape. And rounding out the campaign was a billboard initiative in which Corona replaced its typical pristine beach imagery with that of polluted shores, and changed its tagline from “This Is Living” to “This Is Living?” (Agency: Wieden+Kennedy, Amsterdam). Social currency began as a way to incentivize consumers to engage with brands, but thanks to Citi, the concept took a charitable turn over the spring. For the fourth iteration of its Taste of the Nation co-sponsorship, which supports No Kid Hungry, the brand introduced “Share a Pic, Share a Meal.” The initiative encouraged attendees at Taste of the Nation events to post a photo of their favorite foods or beverages on their social channels along with #CitiGiving and the vendor’s specific hashtag. For every post featuring the event hashtag, Citi donated a meal to No Kid Hungry. 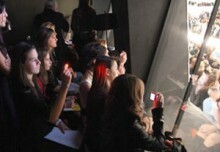 To help amplify the campaign, Citi for a second year added live music to the events—including performances by X Ambassadors, Caitlyn Smith, Betty Who and The Shadowboxers—all of whom were encouraged to share the initiative with their legions of social media followers (Agency: MAC Presents, New York City). 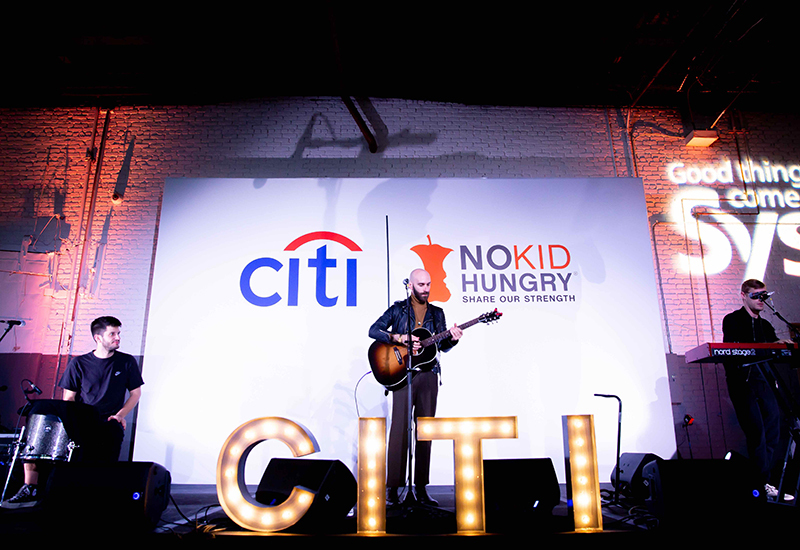 Citi added live music to amplify the fourth iteration of its No Kid Hungry campaign. Colgate cleverly leveraged partnerships with two sports influencers to raise awareness of water scarcity and encourage conservation, just in time for World Water Day on March 22. Understanding that nearly four gallons of water can be wasted if the faucet is left running while a person brushes his or her teeth, Colgate asked consumers on World Water Day to turn off their faucets as they brushed. The “Save Water” campaign has been a multi-year effort, but for 2018, the brand announced its sponsorship of #RunningDry, an initiative developed by environmentalist and “ultra-runner” Mina Guli, who ran 100 marathons in 100 days across six continents to help shine a spotlight on water struggles around the world. Colgate also teamed up with former Olympic swimmer Michael Phelps, who encouraged his millions of social media followers to turn off their faucets because #EveryDropCounts (consumers can make pledges at EveryDropCounts.Colgate.com). Other components of this year’s campaign included a comprehensive Times Square billboard takeover featuring Phelps and “Save Water” messaging, as well as appearances by Guli; a water-activated drain sticker that revealed the words “Turn off the Faucet” when it came in contact with water; and a call to action using Google Assistant introduced a few months earlier that allowed consumers with a Google Home or compatible smart speaker to learn water facts, hear conservation tips and ask to hear the sound of running water while brushing with the faucet off. 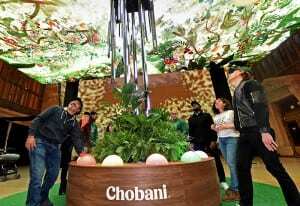 Chobani’s digital fruit tree invited consumers to “plant” virtual seeds linked to product SKUs. You know a food brand is making an impact when it executes a successful activation without distributing a single sample. 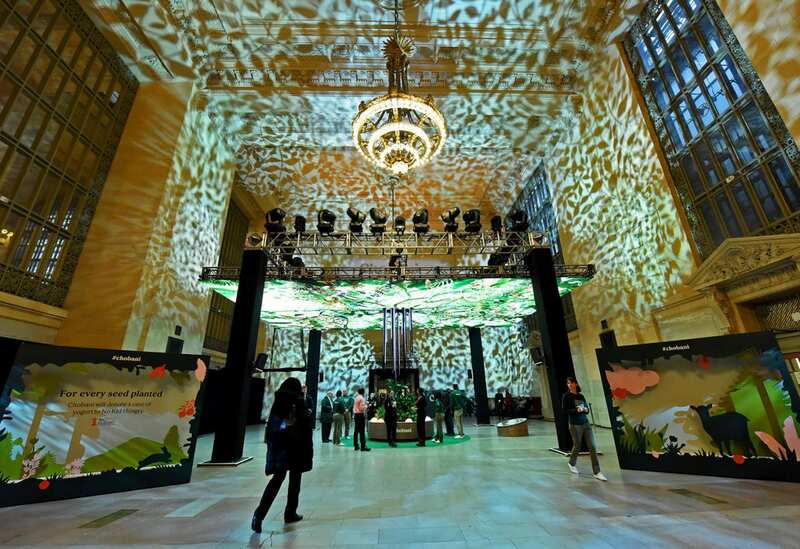 Such was the case for Chobani, which celebrated its 10th birthday and brought to life its “One For All” anniversary initiative, a campaign that centered on a digital fruit tree at Grand Central Terminal, where consumers were invited to interact with the installation by “planting” virtual seeds, each of which corresponded to a popular Chobani SKU. 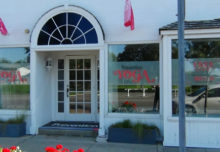 The experience began just below the “trunk” of the tree in a mini garden display featuring colorful “orbs.” In order to plant a virtual seed, participants placed their hands on one of the orbs, which, when touched, triggered pressure sensors that caused it to pulsate with light energy. When the individual removed their hand, effectively planting the seed, it set off a digital fireworks display of sorts in the tree canopy above. For each virtual seed planted, Chobani donated a case of yogurt to No Kid Hungry (Agency: HUSH, New York City). Jefferson’s Bourbon supports ocean life by selling small batches aged on a research vessel. Consumers first labeled it a marketing gimmick, but after learning what takes place behind the scenes of Jefferson’s Bourbon’s unlikely partnership with Ocearch, the tides quickly turned. The whiskey brand regularly teams up with the nonprofit, which aims to protect the ocean by “defending the animals which governs its food chain,” to save sharks and age bourbon all in the same place, at the same time. The initiative was derived from the notion that the constant movement of bourbon in its barrel matures the whiskey faster because more liquid is in contact with wood more often. 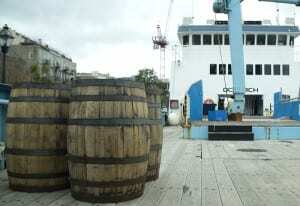 So Jefferson’s strapped a handful of its bourbon barrels to the MV OCEARCH, a 126-foot vessel that serves as Ocearch’s mother ship and mobile lab, and discovered that the voyage did indeed alter the flavor of the liquid, which came back tasting darker and more complex. Jefferson’s then began selling the rare bourbon, with a portion of the proceeds going directly to Ocearch, which depends on sponsorships to fund its research efforts. Currently, the MV OCEARCH is carrying four barrels of Jefferson’s Bourbon and embarks on seasonal expeditions to gather data on the ecology, physiology and behavior of sharks in the North Atlantic. The program has also vastly expanded to encompass multiple ships that stop at roughly 30 different ports on five continents, with 180 Jefferson’s barrels on the ocean at all times. When it was founded in 2006, “One For One” brand TOMS, which donates a pair of shoes to a person in need for every pair it sells, became the first for-profit social impact company. Twelve years later, the company says it is seeing even greater consumer interest in mission-based brands thanks to the value younger generations place on creating positive change. 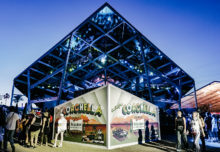 For its latest cause-related campaign, TOMS hosted a launch event in L.A. for its Venice Collection. 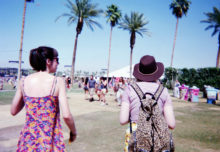 In addition to offering live music, the brand enlisted speakers and panelists who aligned with its business, like the founder of Art with Purpose, the chief trainee director at Homeboy Industries and the developer of the AnxietyHelper app. Even the food and spirits vendors, which included Everytable, a company that prices its meals based on the neighborhood it’s serving, and Dreaming Tree Wines, which focuses on sustainability, had a purpose. Food for thought.